Ultimate Guide to WebRTC - What is WebRTC and How to get Started. Web Real-Time Communication(WebRTC) is both an open source project and specification that enables real time media communications like voice, video and data transfer natively between browsers and devices. This provides users with the ability to communicate from within their primary web browser without the need for complicated plug-ins or additional hardware. The WebRTC project was first announced by Google in May 2011 as a means of developing a common set of protocols for enabling high quality RTC applications within browsers, mobile platforms and IoT devices. At the time, Flash and plug-ins were the only method of offering real time communication. Two years later, after considerable work, the first cross browser video call was established between Chrome and Firefox. Since then, support for WebRTC in the developer community has skyrocketed as more and more organizations add their support for the specification. Today, WebRTC is available natively (to varying degrees) in Chrome, Firefox, Safari, Edge, Android and iOS and is a widely popular tool for video calling. 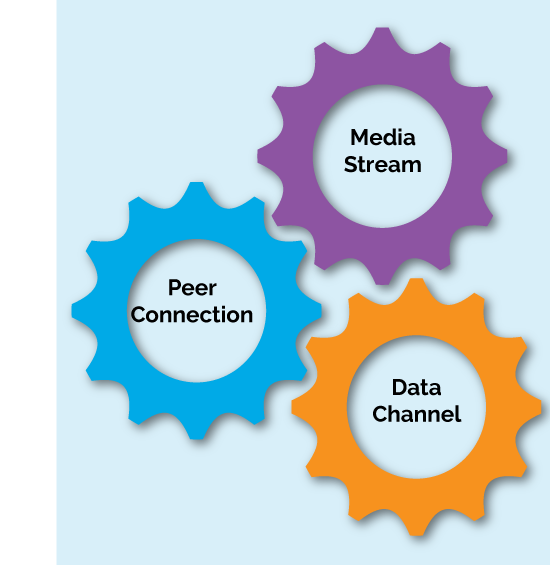 The Peer Connection is the core of the WebRTC standard. It provides a way for participants to create direct connections with their peers without the need for an intermediary server (beyond signaling). Each participant takes the media acquired from the media stream API and plugs it into the peer connection to create an audio or video feed. The PeerConnection API has a lot going on behind the scenes. It handles SDP negotiation, codec implementations, NAT Traversal, packet loss, bandwidth management, and media transfer. The RTCDataChannel API was setup to allow bi-directional data transfer of any type of data - media or otherwise - directly between peers. It was designed to mimic the WebSocket API, but rather than relying on a TCP connection which although reliable is high in latency and prone to bottlenecks, data channels use UDP-based streams with the configurability of the Stream Control Transmission Protocol (SCTP) protocol. This design allows the best of both worlds: reliable delivery like in TCP but with reduced congestion on the network like in UDP. Before a peer-to-peer video call can begin, a connection between the two clients needs to be established. This is accomplished through signaling. Signaling falls outside of the realm of the WebRTC specification but is the vital first step in establishing an audio/ video connection. Signaling allows two endpoints (senders, receivers, or both) to exchange metadata to coordinate communication in order to set up a call. For example, before two endpoints can start a video call, one side has to call the other, and the called side has to respond. This call-and-response message flow (also known as offer-answer message flow) contains critical details about the streaming that will take place - the number and types of streams, how the media will be encoded, etc. - and is often formatted using the Session Description Protocol (SDP), a standard format used by many real-world systems, including VoIP and WebRTC. 1. Generally, the peers do not know each other’s capabilities. 2. Generally, the peers do not know each other’s network addresses. Once the initial signaling for a streaming connection has taken place, the two endpoints need to begin the process of NAT (Network Address Translation) traversal. When NAT assigns a public address to a computer inside a private network it can cause difficulties for setting up a real-time video connection. NAT Traversal is a method for getting around the issues associated with IP address translation. Interactive Connectivity Establishment (ICE) - ICE is used to find all the ways for two computers to talk to each other. It has two main roles, gathering candidates and checking connectivity. It guarantees that if there is a path for two clients to communicate, it will find it and ensure it is the most efficient. It makes use of two protocols - STUN and TURN. Session Traversal Utilities for NAT (STUN) - STUN stands for Session Traversal Utilities for NAT and is a lightweight and simple method for NAT Traversal. 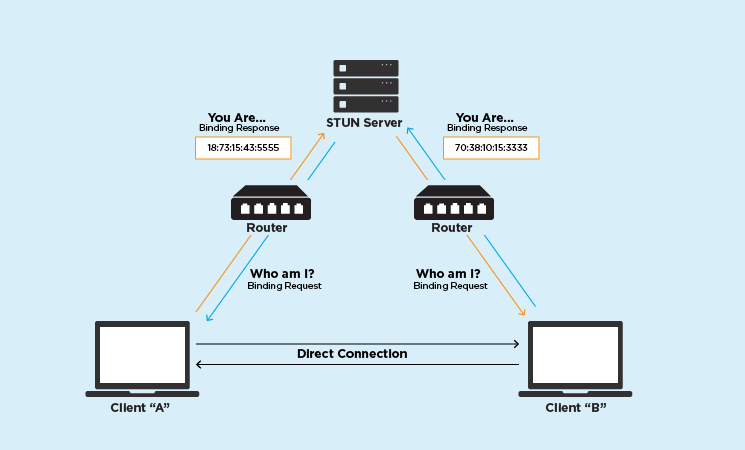 STUN allows WebRTC clients to find out their own public IP address by making a request to a STUN server. 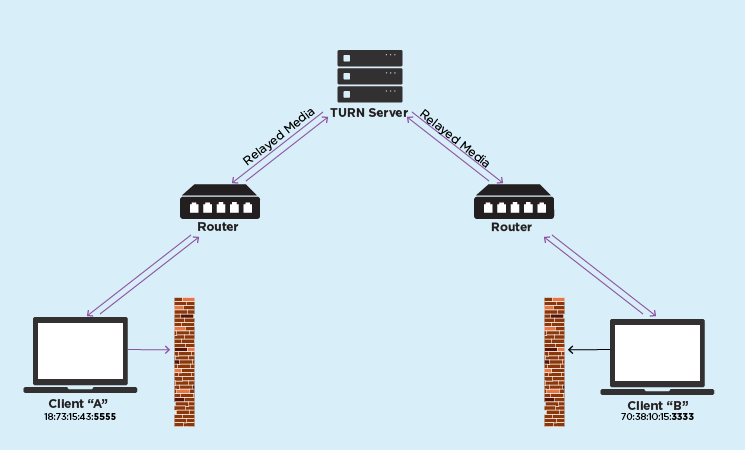 Traversal Using Relays around NAT (TURN) - The TURN server assists in the NAT traversal by helping the endpoints learn about the routers on their local networks, as well as blindly relaying data for one of the endpoints where a direct connection is not possible due to firewall restrictions. Before sending the media over a peer connection, it has to be compressed. Raw audio and video is simply too large to send efficiently in our current Internet infrastructure. Likewise, after receiving media over a peer connection, it has to be decompressed. A media codec (coder-decoder) does exactly this. 1. Audio - PCMU (G.711μ) running at 8,000Hz with a single channel (mono). 2. Audio - PCMA (G.711a) running at 8,000Hz with a single channel (mono). 3. Audio - Opus running at 48,000Hz with two channels (stereo). 5. Video - H.264/AVC using Constrained Baseline Profile Level 1.2. Future media codecs like VP9 and H.265 could be added to the WebRTC standard at some point in the future, but for now are not mandatory. RTC experts such as Frozen Mountain’s Professional Services team are often able to add additional custom and future codec support to meet any customer’s requirements. The peer-to-peer (mesh) topology is the only connection type that is covered in the WebRTC specification. However, there are many use cases where a mesh topology is insufficient. Server based topologies can help address these drawbacks and are often used within the world of WebRTC for transferring media. The best topology for any given application depends largely on the expected use cases, as each one has its own unique set of benefits and drawbacks. In a peer-to-peer or mesh topology, each participant in a session directly connects to all other participants without the use of a server. This type of connection is perfect for small video conferences as it is the lowest cost and easiest to set up. However, when conferences grow, maintaining direct connections between all participants becomes unsustainable as it can become too CPU intensive. Since the connections are direct between peers, a mesh topology doesn’t lend itself well to recording. For these reasons, a mesh topology is best for simple applications that connect 2 to 3 participants, where low latency is important, and where recording isn’t required. In a selective forwarding topology, each participant in a session connects to a server which acts as a selective forwarding unit (SFU). Each participant uploads their encrypted video stream one time to the server. The server then forwards those streams to each of the other participants. This reduces latency and also permits things like transcoding, recording, and other server-side integrations such as SIP which would be much more difficult in a peer-to-peer connection. The topology is not without its limits. While having a single upstream connection makes it more upload-efficient than a mesh topology, having multiple downstream connections means each client will eventually run out of resources once a certain number of participants is active in the session. For these reasons, a selective forwarding topology is best for applications that connect 4 to 10 participants, where low latency is important, or where recording is required and integrity is critical. This topology is generally considered the most balanced. In a multipoint control topology, each participant in a session connects to a server which acts as a multipoint control unit (MCU). The MCU receives media from each participant and decodes it, mixing the audio and video from the participants together into a single stream which is in turn encoded and sent to each participant. This requires less bandwidth usage and device CPU but it does require additional server CPU for mixing audio/video into single streams. MCU’s are also a great option for dealing with poor network conditions as it provides the lowest possible bandwidth usage for each individual participant. For these reasons, a multipoint control topology is best for large-scale applications that connect large numbers of participants, or poor network conditions, or where recording is required and integrity is critical. Hybrid architectures allow you to maintain a mix of peer-to-peer, selective forwarding, and multipoint control (mixing) architectures. In a hybrid environment, topologies can change as participant counts increase and decrease. If recording is critical, for example, starting with a selective forwarding topology and then switching to a multipoint control topology around the 10-participant count could make the most sense. If cost is more important than integrity of recording, your application could start with a mesh topology and graduate as needed. Our LiveSwitch server stack is a great example of a hybrid topology and is one of the few hybrid media servers on the market today. For more information on how you can scale your webrtc application, check out our post How to Successfully Scale Your WebRTC Application. As we already know, WebRTC is enacted directly between browsers without the need for plugins. This makes WebRTC inherently safer, because it provides an extra level of protection against malware or other undesirable software installations that may be disguised as a plug-in. Further, because WebRTC is offered as a part of a browser, any potential security threats or vulnerabilities tend to be addressed quickly via auto-updates from the browser vendors. 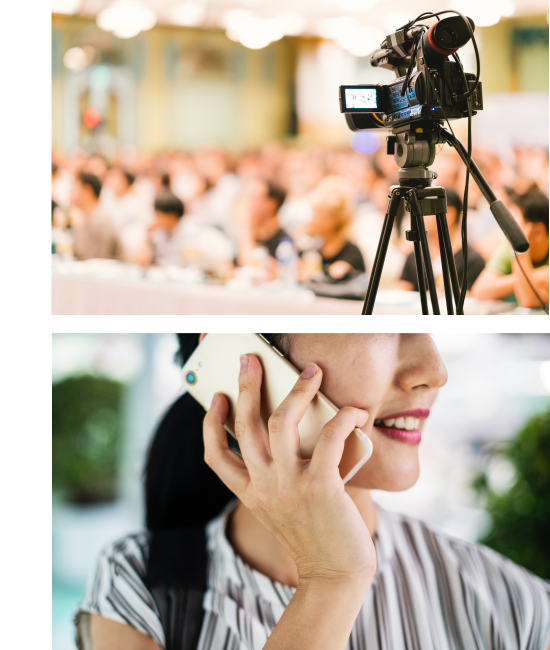 The WebRTC specification has addressed potential concerns to allowing access media resources by requiring explicit permission for the camera or microphone to be used. It is not possible for a WebRTC application to gain access to a device without consent. Furthermore, whenever a device is in use, it will be indicated in the clients UI and on their hardware. Encryption is mandatory part of WebRTC and is enforced on all parts of establishing and maintaining a connection.The preferred method for this is to use perfect forward secrecy (PFS) ciphers in a DTLS (Datagram Transport Layer Security) handshake to securely exchange key data. For audio and video, key data can then be used to generate AES (Advanced Encryption Standard) keys which are in turn used by SRTP (Secure Real-time Transport Protocol) to encrypt and decrypt the media.This acronym-rich stack of technologies translates to extremely secure connections that are impossible to break with current technology. Both WebRTC and ORTC mandate this particular stack, which is backwards-compatible and interoperable with VoIP systems. While the basis of WebRTC has historically been peer-to-peer video conferencing, there are many promising add-ons that can help make WebRTC even more powerful of a real-time communications tool. When combined with efficient server scaling, WebRTC can be used to deliver sub-second latency broadcasts to large audiences. With plugin-free support now from every major browser vendor on desktop and mobile combined with intelligently designed media server clusters, it’s possible to scale to thousands and even millions of concurrent users while maintaining just milliseconds of latency. Download our whitepaper to learn more about live broadcasting and how you can deliver ultra-low-latency media at massive scale with WebRTC. VoIP-based systems and the public switched telephone network (PSTN) are still fundamental components in many enterprises and often include large historical investments into PBXs, gateways, SBCs. While the traditional landline may be slipping away, mobile phones are still ubiquitous, and VoIP deployments in businesses are still standard. Because of this, it’s imperative for some applications for users to be able to dial into an active WebRTC-based session from a phone or have their phone ring when they are invited to join. To do this, you need a gateway or switch that can speak the protocol used by VoIP phones everywhere - the Session Initiation Protocol, or SIP for short. Open source products like Asterisk and FreeSWITCH, which support WebRTC, can be helpful for small-scale deployments. Leveraging a flexible WebRTC stack such as IceLink or LiveSwitch is crucial for the creation of a seamless user experience when integrating such systems. Download our whitepaper to learn more about integrating telephony and SIP into your WebRTC application. Before you can jump into a WebRTC project it is important to have a good understanding of your organizations needs, current infrastructure and possible limitations. Having a good understanding of your present state and future needs will allow you to determine what options you have for developing your own video conferencing platform. Do you need a media server? Before you can fully explore your options, you need to have a good understanding of your session requirements. Particularly, what is the maximum number of users that need to be connected in a session at any given time, and what are the capabilities of the network and devices you expect them to connect from? If you only need to connect two or three people in a video conference and the user’s are all expected to have powerful devices on high speed uncongested networks then a media server may not be required for the success of your application. If you need to connect 4 or more participants or if you will be connecting participants in remote areas with older laptops or smartphones, then a media server is necessary. It is important to note that session needs often change over time, so consider carefully whether you might need to host larger sessions in the future. Do you want to host your application in the cloud or in-premises? If you determine a media server is required, your next step is to decide whether you want host your application in the cloud or on-premise. Each option is valid depending on your specific requirements. Many commercial WebRTC-based video conferencing products on the market today are cloud based offerings. In general, clouds are a great options for organizations who are looking for a solution that can be easily deployed and can be scaled up quickly with minimal oversight from your team. It is important that organizations considering cloud based video conferencing options carefully check the data security protocols of the provider to determine the risk and whether the offering complies with data protection laws. Media servers can also be hosted on-premise. This is a great option for organizations that are seeking maximum control over their data. On-premise solutions often appeal to those in risk-adverse industries like governments, financial institutions or healthcare. It is important to note that “on-premise” can be a bit of a misnomer. While some media servers are physically hosted on your own premises, others could be hosted in a private cloud controlled by your operations team. The difference is your organization has the ability to choose your own cloud infrastructure provider based on your own unique specifications and risk tolerance. Frozen Mountain’s LiveSwitch server is completely compatible with all cloud infrastructure providers including AWS, Azure, Oracle, Digital Ocean and more. In some instances, this could be a more cost effective option as you are dealing with the cloud provider directly, rather than through a third party. However, owning, operating and maintaining your own media server on-site also implies costs that may or may not work with your business model. Do What type of WebRTC-enabled video conferencing will best match your needs and the level of expertise you have in house? There are a wide spectrum of options out there for creating a video conferencing system; from creating it from scratch using open source, to ready made platforms and everything in between. Below we will go through the 5 most common types of services. The first option available to developers is to build your own platform from scratch using open source code. The source code for WebRTC is freely available to the developer community to use or modify as they see fit. Creating your own application with the open source code available can be a good option if you have enough skilled WebRTC developers available to take on the project (there are less than 12,000 worldwide), have the time to devote to the applications development, are comfortable sourcing media and signaling servers, and are in a position to navigate the uncertainties that come with any development project. A software development kit (SDK) is a set of tools provided by hardware and software providers that is used for developing applications. SDKs operate on the client side of an application and are usually comprised of application programming interfaces (APIs), sample code, and documentation. Using an SDK to build your video conferencing application is a good choice for developers who are looking for more control over their solution. It is also ideal for organizations who wish to manage their own data centers or cloud deployment. LiveSwitch and IceLink are great examples of commercial SDKs that provide varying levels of WebRTC capabilities that can be built into applications. Some organizations may wish to outsource pieces of their WebRTC development to others. These pieces are offered as a service, also known as a Software as a Service (SaaS). SaaS is a cloud based software solution that hosts applications and makes them available to customers over the internet. It is possible to combine an SDK or open source project with some SaaS offerings. Some examples of pieces that may be purchased as a SaaS include: TURN servers, NAT Traversal, and signaling servers. WebSync Cloud would fall into this category. CPaaS stands for Communications Platform as a Service. A CPaaS refers to a cloud-based platform that enables developers to add real-time communications features like voice, video and messaging capabilities in their own applications without needing to build backend infrastructure and interfaces. Using a CPaaS is a great option for those who are looking to reduce their time to market and their upfront development costs while maintaining a large degree of control over their solutions design and development. As it is a cloud-based offering, customers need to do their due diligence to ensure the cloud mets all security requirements. The last option is purchasing a turn-key video conferencing solution. These solutions are designed to be fully complete and are ready for use by the average consumer on purchase. This can be a good option for organizations who don't have access to software developers and who are OK with paying a little more for a product with limited flexibility. If you are unsure of what WebRTC option is right for you, consider investing in an architecture assessment. This is a great first step for those who are looking for a path forward for their WebRTC project. How can Frozen Mountain help me with WebRTC? Frozen Mountain offers WebRTC SDKs, server stacks and professional services that allow organizations to easily incorporate live video, voice, messaging and more into their applications. In addition to developing enterprise-quality WebRTC products, Frozen Mountain also has a dedicated professional services team who provide a wide range of services to help companies accelerate their application development. Learn more about WebRTC development with Frozen Mountain.